Image extracted from "Album of Philippine Types: Christians and Moros" where it is labeled Plate 39. This was something that many nationalists and intellectuals back in the country did not find amusing since the move was construed as a deliberate attempt to portray the Filipinos as backward, notwithstanding the fact that there were many among them who were even European-educated. 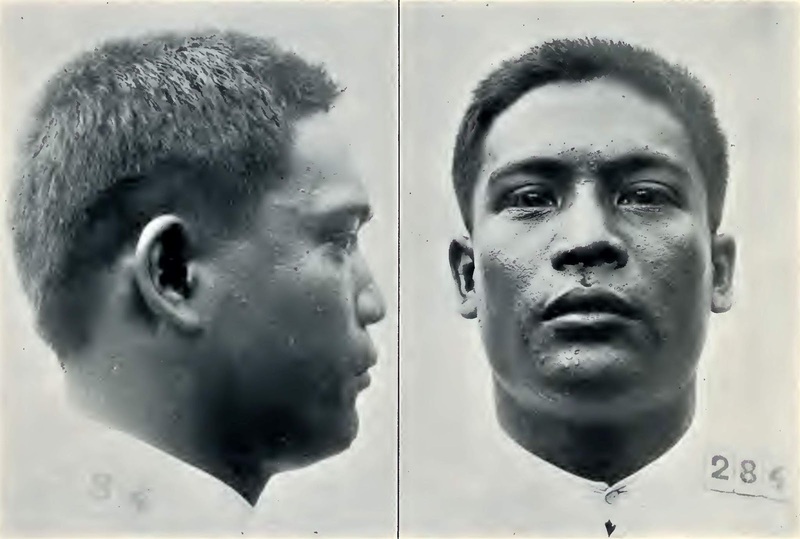 Perhaps just as offensive was a 1904 publication3 presumably intended for distribution during the World Fair, which showed pictures in an album of “typical” Filipino men as sampled from inmates of the Bilibid prison. On the face of things, the album appears to have presented Filipinos as though a Biology book would simian species. To put matters in perspective, however, this was an era when the American public was hungry for information about their newly-acquired colony; and suffice it to say that there was a fair amount of opposition to the annexation even among Americans. Portraying Filipinos as backward at the fair was, perhaps, part of an attempt by the American leadership to justify to its own public its “benevolent acquisition and rule” over the Philippines. Why prisoners were selected as representatives of average Filipino “provincial types” was probably a matter of convenience, since the men were incarcerated and easy to study. The averages would have been reasonably accurate since they were of physical rather than behavioral attributes. Standard deviations would have been useful, albeit not provided. First, all the men available from a given province, in some cases over one hundred, were lined up by height, and from twenty to fifty, where possible, these being of all heights, were taken for measurements. Secondly, from the ranks of these chosen men a selection was made by intervals for photographs and for more minute study; the resulting list was thus fairly representative of the chief physical types; if any were manifestly abnormal they were rejected. Thirdly, from the large number of photographs thus obtained for the exhibit, fifteen or twenty in the case of some provinces, it was aimed to select two of the best for the Album. As will be seen from the record of measurements printed opposite each photograph, the men selected were generally those nearest the average of their province, although this was impossible in some cases. There were seven Tagalog provincial types included and the averages were calculated from 169 inmates measured. Their physical attributes were described as fairly representative of those of the “neo-Malays,” presumably in reference to the race of people predominantly found in Southeast Asia. Of the 169, 28 were from Batangas. The averages are presented in the table below, the second column containing the Batangas averages while the third has the averages for all Tagalog provinces. 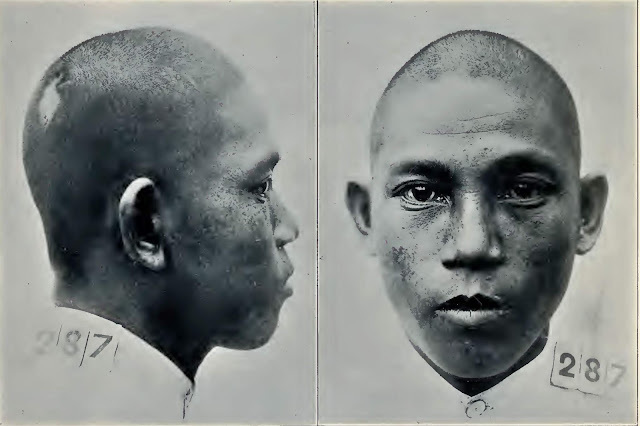 The top photo, labeled as Plate 39 in the publication, shows a sample of a man from Batangas with measurements slightly above the provincial averages for Batangas, with the height of 1.718 meters; span of arms of 1.743 meters; width of shoulders of 0.439 meters; length of head of 0.183 meters; breadth of head of 0.159 meters; height of nose of 0.053 meters; breadth of nose of 0.041 meters; chest of 0.908 meters; weight of 66 kilos; cephalic index of 86.89%; and nasal index of 77.36%. Below, meanwhile, is a sample of a man from Batangas with measurements slightly lesser than the provincial averages for Batangas. The picture is labeled Plate 40 in the publication. The man’s dimensions are: height of 1.460 meters; span of arms of 1.500 meters; width of shoulders of 0.398 meters; length of head of 0.175 meters; breadth of head of 0.142 meters; height of nose of 0.050 meters; breadth of nose of 0.038 meters; chest of 0.830 meters; weight of 42.18 kilos; cephalic index of 81.13%; and nasal index of 76%. Image extracted from "Album of Philippine Types: Christians and Moros" where it is labeled Plate 40. The reader will please note that both photographs have been treated with graphic software to lighten both men’s complexions which are exaggeratedly dark in the publication. 1 “Louisiana Purchase Exposition,” Wikipedia. 3 “Album of Philippine Types: Christians and Moros,” by Daniel Folkmar, published 1904. 4 Cephalic index is ‘a number expressing the ratio of the maximum breadth of a skull to its maximum length.’ Wikipedia.